Why do they get so much attention? How do they keep producing such awesome blog posts? Why can’t I do the same? These questions used to bug me. But as it turns out, there’s no genius to it. In fact, writing a great blog post is more formulaic than it is artistic. It’s not about being innovative, creative and making something unique. Writing a killer blog post is about understanding the different elements – that when combined add up to something special. Taking what others have already figured out, and packaging it up in a way that captures your own personal touch. You are just as qualified as anyone else to do it – you just need to get your hands dirty. I’ve been obsessing about it – gathering the best blog content I can find, and figuring out what makes it all so good. Why these blogs get more traffic, shares and engagement than all of ours. The end result is the 21 elements in this blog post. All nicely packaged up with examples and tips for you to take action. You can get a PDF copy of this post as a checklist here. Lots of bloggers obsess over the headline…. But for good reason. 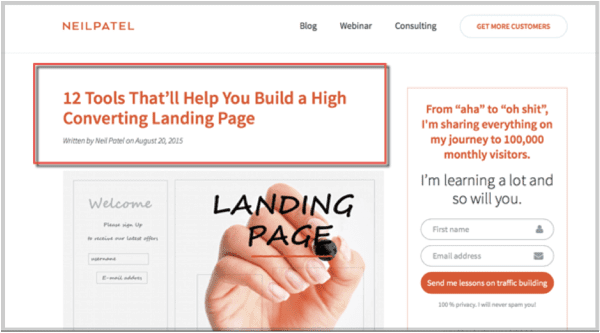 It’s perhaps the most important component for drawing a reader in, and getting them to click on your blog post at all. It needs to grab the reader by the shirt and compel them to click. Note: Don’t forget your SEO keyword or phrase in the headline too! Once someone clicks on your headline, you need to keep them engaged and interested. 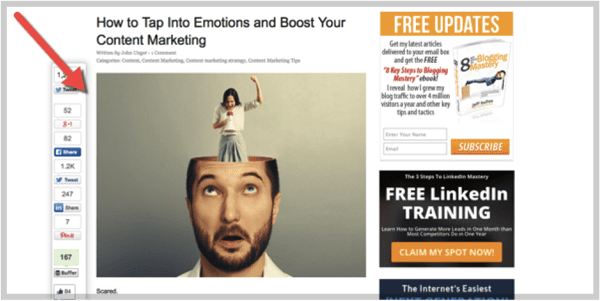 An eye-catching header image draws people into your blog post and makes them want to continue reading. There is no perfect science to picking a header image, but it’s important to remember that they should be an extension of your brand. You need to answer this question early in your blog post. Exactly why a reader should continue reading needs to be painstakingly obvious. When I read the intro of your blog post I want to burn a little inside. Get inside your reader’s head and make them feel uncomfortable. Bloggers that manage to initiate this sensation in their reader’s have a deep understanding of the problem they are about to address. This deep understanding shows you that they care about you and are about to deliver something that will help you overcome a challenge. This hook isn’t generic, it is written in a language that your audience understands and resonates with. What you’re about to say is important to them, and they are desperate to keep reading. If you are at all confused about your personal brand, you are about to get clarity from reading this blog post. This is why you should care, it is obvious and direct. Too often blog posts have a way of wandering off and trying to prove about 3 or 4 different points. This is the quickest way to confuse your audience and lose their attention. Every post you write should above all else, empower your reader to do one thing. That one thing will guide the direction of the whole post and act as an anchor for every supporting point you make. It tells your readers what is important and gives you a reference point as you write the rest of the article. For example, in this post I have provided a list of attributes that typify a well executed blog post. 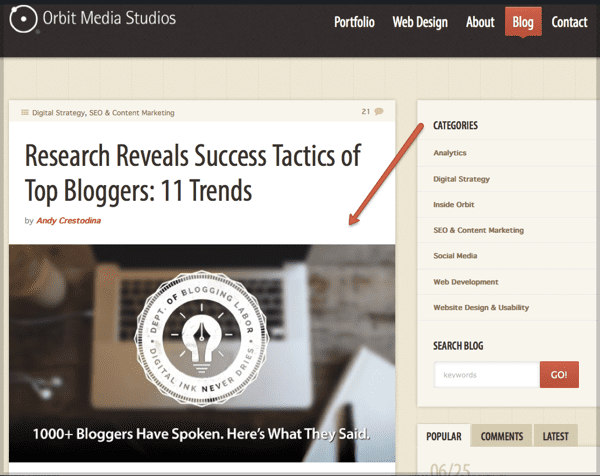 It is my goal to enable readers to shortcut their way to a better style of blogging. If readers were to leave with just one message… It should be your ace. The best blog posts challenge our current beliefs. They stir up interest by being different, and offering a unique point of view. If you want to stand out and get noticed, you need to say something that no one else is. Sure it’s easier to grab a trending topic, slap a clickbait headline on it and get a bunch of traffic. But how does this contribute to your greater goals for blogging in the first place? It certainly doesn’t make you a thought leader. It bundles you up with everyone else already producing the same tiresome content, over and over again. Push yourself to be different and challenge the status quo – that’s when people will take notice. Every time your reader sees a question mark they are already trying to answer the question you just asked in their head. By adding questions throughout your post (most importantly in the introduction), you keep the reader guessing. If they don’t already know the answer, they will want to keep reading. But if they do know the answer, they may just decide to keep reading anyway because they want to reinforce their knowledge. Try and ask open-ended questions. Tap into problems or desires that are universal, and then begin to get more specific as you get further into the blog post. Your aim when asking a question isn’t to eliminate readers, it’s to spark curiosity and bring more along the journey with you. The Buffer blog is one of my favorite reads. Below is an example of how they use questions up front to attract interest from the reader. If you fit into either of these buckets, you will keep reading that blog post. A good metaphor packed together with a personal story helps us understand things with more depth. When delivered well, they can break down a complex topic and let us access meaning we never knew was possible. Not only do they help others understand what you are talking about, but coming up with metaphors and stories help us understand things better ourselves. The process helps us get crystal clear about what we are saying and why it is important for our audience to understand. Brian Dean is a seasoned exponent of metaphors to deliver a message. 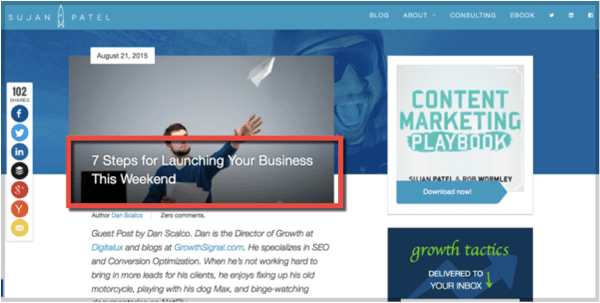 His ‘Content Roadshow’ 1-2 punch promotion strategy, is a great example. Our attention spans are shorter than ever. Instead of writing long, bulky paragraphs – aim to pack a punch with short, action packed statements. 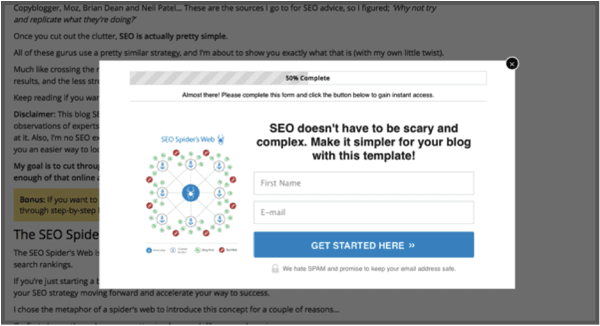 Not only does this way of writing increase the chance that someone will read your blog post. It also keeps them interested and intrigued to see what is about to come next. At the end of the day, blogging is about your readers – it’s not about how smart you can sound, or how fancy your vocabulary is. Forget about high-school grammar and start to understand how people like to read online. In fact, there’s research that proves people like to read at an 8th grade level, even PhD’s. Writing a great blog post is not about how smart you sound. It’s about how you can help your reader. How you can explain something they don’t currently understand in a way that makes sense and they can take action on straight away. Using superlatives and fancy words actually makes you sound like you are covering something up, not being smart. If your reader has made it past the headline and the intro. Then what? Can you now dump everything you have ever heard about a topic into one big paragraph? There is still time for me to leave. To decide not to share. To decide not to opt-in. There is still time for me never to return. So make it easy for readers to skim your blog post. Sub-headings and bullet points let your readers scan the post and choose their own journey – decide what they would like to read more about. Much like sub-headings and bullet points, appropriate formatting helps your readers spot the most important information. It taps into their visual senses, and allows them to skim your content – while still picking up the information they really need to know. Use bold text, colons, italics, capital letters, block quotes – even different font colors if you want. Breaking it up lets us consume it quickly, share it around and go and take action. Below is an example from Amy Porterfield with almost all of these elements. It doesn’t matter how well you have written it, or how many helpful tips are in there. A wall of text just doesn’t cut it any more. People like bright and shiny things. It’s no surprise that the biggest social movements of our time are all about visual media like Snapchat, Instagram and Periscope. Use images, screenshots, infographics and videos as much as you can. If you are looking for some visual inspiration, Alex Turnbull and his blog over at Groove HQ are the perfect benchmark. Encourage them to trace their eyes from line to line with short sentences, line spacing and provocative language. The idea is that the further down a page someone scrolls, the more chance they are to do something – share it, opt-in or write a comment. This suggests that there is more to come, something perhaps even more valuable than the last sentence. Naturally the reader will want to find out what is coming next. 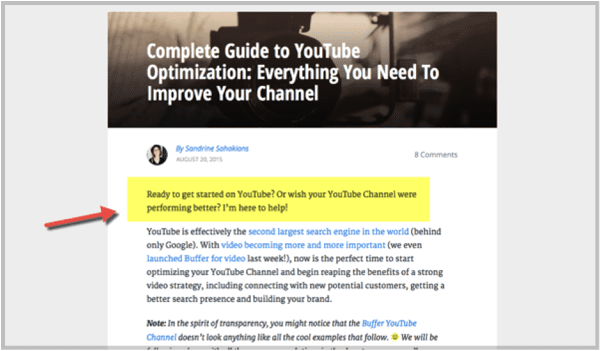 Your blog introduction is a great place to use delayed transitions. Here is an example from Will Hoekenga at Copygrad. The best content marketers find a way to connect personally with their audience. They share stories, get vulnerable and bring people on a journey. Unfortunately, a big reason for many of us failing with blogging is we forget about the human connection. At the end of the day, there is a person on the other end of that computer – they are the ones you need to convince. So don’t focus on cranking out as much content as you can, draw your readers in with a touch of humility. If you can get them to respect what you have to say, and feel like they are part of the experience – they will come back over and over again. Too often we make broad assumptions about what people already know, and we write content based on those assumptions. There is a fine art to being an educator. And that’s what we are as online marketers – educators. We are helping people understand topics that we have already figured out. To teach something to someone, you need to describe it in a language they understand. You need to understand where they are on their journey, and meet them there. If you start from too far ahead, they won’t get it. They may think you sound smart for a moment, but then they’ll just leave your site – and never come back. Because you aren’t meeting their needs. You’re not trying hard enough to understand where they are coming from. If they don’t even know what a motorcycle is, don’t start to talk to them about Harley’s. We are writing content for humans, but we are selling ourselves to robots. There is no two ways about it – keyword stuffing is long gone. It won’t help you turn up on page one anymore. But Google is still a robot. So we need to help that robot understand what we are talking about. Your number one focus should be to write content that is helpful, and engages human beings. 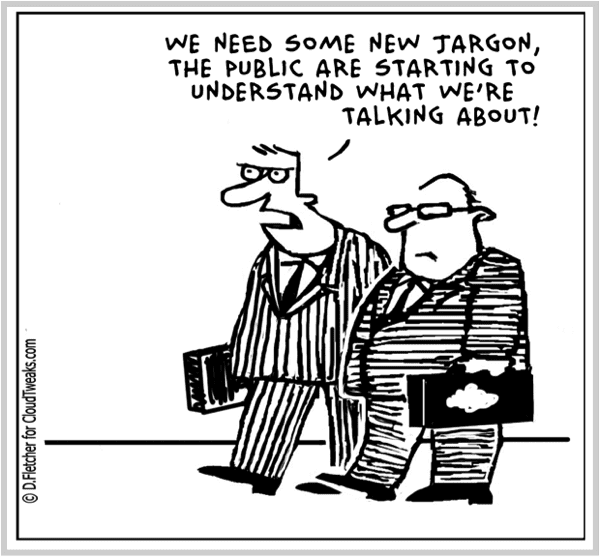 After you have nailed that agenda, drop the most relevant keywords into your post where they make sense. Preferably the heading, sub-headings and body as a minimum. If you find yourself drifting off topic….. Take a breath, share a link, and get back on track. It’s very easy to get in the rhythm of writing and want to include everything you can think of about a topic. But this isn’t helpful to your reader. Instead of veering off track, include a link to another resource that explains the ‘off-track’ topic in more depth. This is valuable to your reader, plus search engines see a relevant external link as a sign of quality. Win-win. In-text links are a vital component to user experience and improving your SEO performance. Make sure these internal links are deliberate by sending users to your ‘Content Hubs’, and make sure the anchor text (the words you are linking) are relevant to the page you are sending people to. 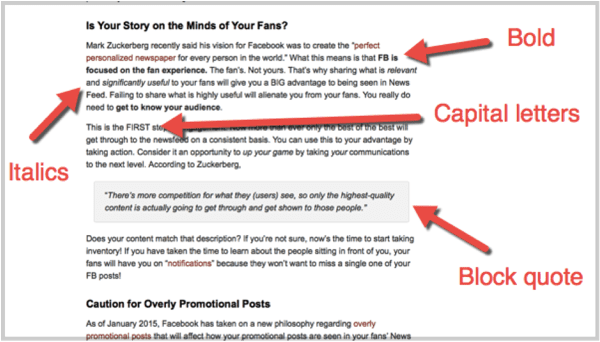 If someone makes it all the way to the bottom of your blog post… Don’t leave them hanging. Give them a specific next step they could take that will help them put your suggestions in action. 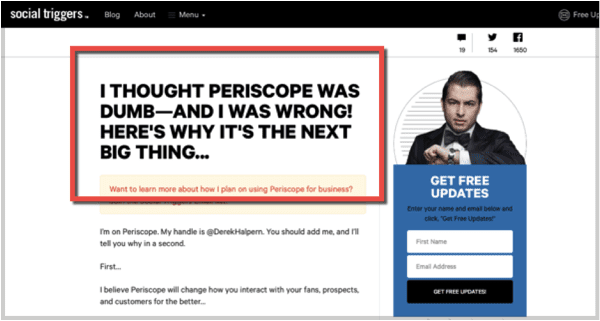 This is not a call to action from a ‘conversion’ sense, but it is more related to how your readers will take action on your advice. Don’t miss the opportunity to get a lead. After all, why are you blogging in the first place? If it is to grow your business – ask for an email address. But don’t expect to get one unless you give something up for free. 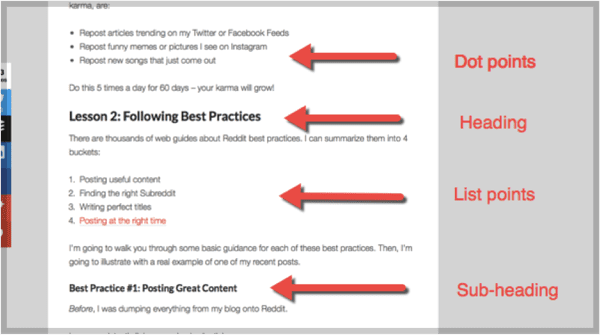 Make your CTA unique, tailored and specific to that blog post. 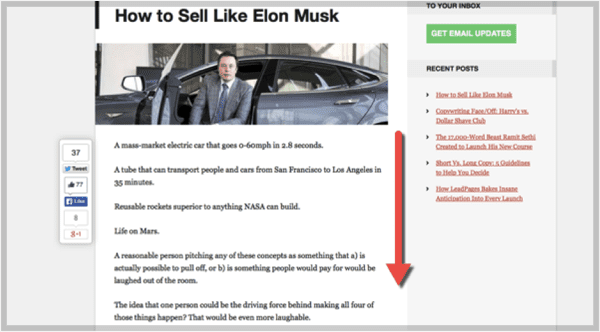 This is how you will convert more readers into leads. For example, I’m about to offer you a downloadable checklist that mirrors this blog post – you can use it every time you write a post to improve quality, get more shares and talk to search engines. Isn’t that more enticing than a generic eBook? Or a ‘Join my mailing list’? 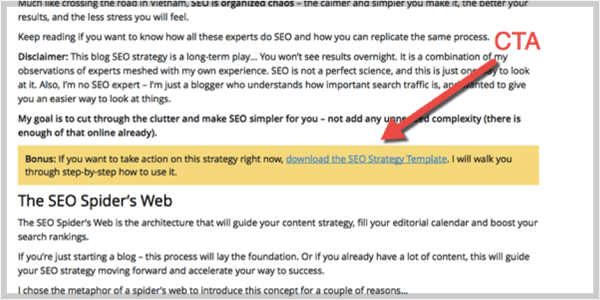 Below is another example of this tactic in a blog I wrote about a site’s seo strategy. My blog posts are behemoths (This one has just cracked 2,276 words)… But my audience tends to like that depth. Not everyone does though, so make sure your posts are appropriate to the audience you are talking to. It’s not rocket science. It’s just blogging. True there are a lot of blogs out there. But most of them are pumping out pretty ordinary content. The more average content there is, the more chance there is for you to rise to the top. It’s easy to get lost in in a sea of clickbait headlines, boring blog posts and generic content. Instead, you could choose to be different. All it takes is a proven formula and some elbow grease. I’ve just given you the formula, so what excuse do you have now? If you want this list to sit next to you when you write your next blog post, you can download it as a PDF checklist here. Will Blunt is a blogger, researcher and entrepreneur. 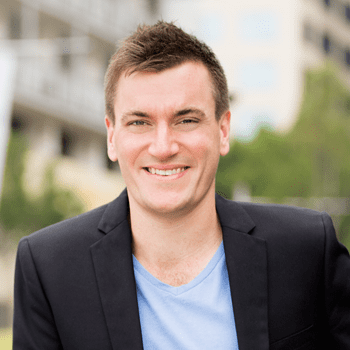 He is the founder of Blogger Sidekick, creator of the Blog Strategy Canvas, and Managing Editor at Bluewire Media, rated Smart Company’s Number 1 Business Blog in Australia. You can find Will on Twitter. Thank you for sharing your post. It will help me to improve my blog. I think if you want to create a good blog you need to know how to communicate with your audience. Thanks Blunt for sharing these tips. I am going to apply these technique to my blog. Hope it will increase audience on my blog. Hi Blunt. These 21 elements look effective. Might as well try it in my own blog posting strategy. Actually I’m excited now and give my blog a new look and style. Thanks for sharing this one. It’s really helping a lot of content managers out there. Great post 🙂 Thank you for that. Hope it will increase audience on my blog. As always, every new post you write is a new learning opportunity. Thank you. 🙂 I added it to my kippt! Very detailed and helpful. Thank you. Each and every single step is mentioned accurately. I personally believe that the newbie blogger can not find such precise information anywhere else. Much appreciated information. Thanks for sharing. A few things in here I have not contemplated some time recently. Great things you’ve always shared with us. Thanks. keep continue composing this kind of post. Thank you for for sharing so great thing to us. I definitely enjoying every little bit of it I have you bookmarked to check out new.